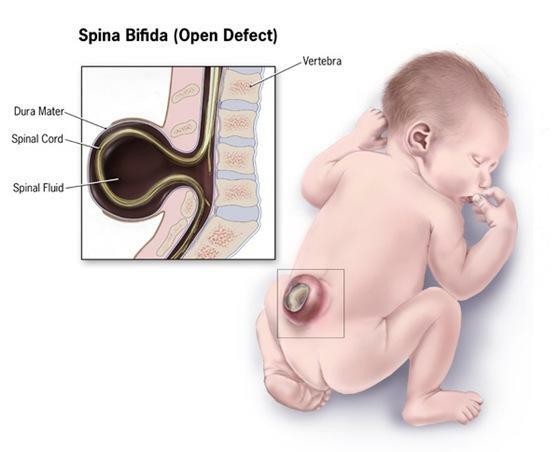 Spina bifida is a birth defect that involves the incomplete development of the spinal cord or its coverings. The term spina bifida comes from Latin and literally means "split" or "open" spine. Spina bifida occurs at the end of the first month of pregnancy when the two sides of the embryo's spine fail to join together, leaving an open area. In some cases, the spinal cord or other membranes may push through this opening in the back. The condition usually is detected before a baby is born and treated right away. The two forms of spina bifida are spina bifida occulta and spina bifida manifesta. Spina bifida occulta is the mildest form of spina bifida (occulta means hidden). Most children with this type of defect never have any health problems, and the spinal cord is often unaffected. Doctors also may use ultrasound to see if a baby has spina bifida; in some cases, the spinal defect can be seen on the ultrasound study. Amniocentesis also can help determine whether a baby has spina bifida. A needle is inserted through the mother's belly and into the uterus to collect fluid that is tested for AFP. The location of the gap in the back often dictates what kind of adaptive aids or equipment a child with myelomeningocele will need. Those with a gap high on the spinal column and more extensive paralysis often need to use a wheelchair, while those with a gap lower on the back may be able to use crutches, leg braces, or walkers. Cornell researchers report that they have identified a gene that causes neural tube defects (NTDs) in laboratory mice. NTDs, also known as spina bifida and anencephaly, are one of the most common birth defects in the United States, occurring every 1 in 1,000 births. Women who are at risk potential of having babies with NTDs cannot be identified because the genes causing this birth defect have not been evident. The new study, published in the American Journal of Clinical Nutrition (February 2011), provides evidence that the so-called Shmt1 gene and most likely the entire folate pathway for thymidylate synthesis in which Shmt1 participates, is responsible for human NTDs. "Although it must be proven through human studies, based on the similarity of folate metabolism in mice and humans, it is likely that this gene is associated with human NTDs," said Patrick Stover, professor in the Division of Nutritional Sciences. Certain women are genetically prone to having a child with an NTD, and maternal folic acid consumption before and during pregnancy can reduce the risk up to 70 percent, Stover said. Women who do not know they are susceptible to this birth defect may not take the necessary measures to protect their unborn child, he said; the defect can form as early as 28 days after conception. In this study, Stover and Cornell colleagues disrupted a gene known to interact with folate and showed that it resulted in folate-responsive neural tube defects. They discovered that deletion of just one copy of the Shmt1 gene in mice resulted in 50 percent less Shmt1 protein expression and in folic acid-responsive neural tube defects. "This is the first example of a genetically altered mouse model that exhibits folate-responsive NTDs when a folate-metabolizing gene is knocked out, where as many other folate-related genes have been knocked out and not resulted in NTDs," said Stover. "This tells us which pathway in folate metabolism leads to NTDs."